Seattle…a place we love and hate all at the same time. We love it because as former Bay Area residents it reminds us of a scaled down version of San Francisco in many ways, including the ferries, waterfront restaurants and piers, the fresh seafood and climate. We hate because…well because of the Seahawks. As lifelong 49er fans being surrounded by people wearing the 12th man jerseys in the off season was hard. Very hard…But we endured it for the sake of adventure and family. Sorry for the grainy photo but it was dark all the time in the shade. While our site was far from level we were happy to fit AND have electric. Beautiful park too! Our niece and nephew, Tina and Eddie, live just across the bay in Bemmerton and Illahee State Park is just a short drive from their house. There were just a few spaces in their small campground that could accommodate our 32 foot Class A and only 2 had electric. This trip was pre-solar but with the sites all very heavily treed it would have been useless anyway so an electric site was a must. We lucked out an nabbed the only suitable site…thankful even though it was far from level (that’s what blocks are for, right?). While the “kids” were busy working we took a ferry into Seattle to check things out. I had scoured the Internet for things to do and the “best of” lists but we were only able to scratch the surface of what makes up Seattle. 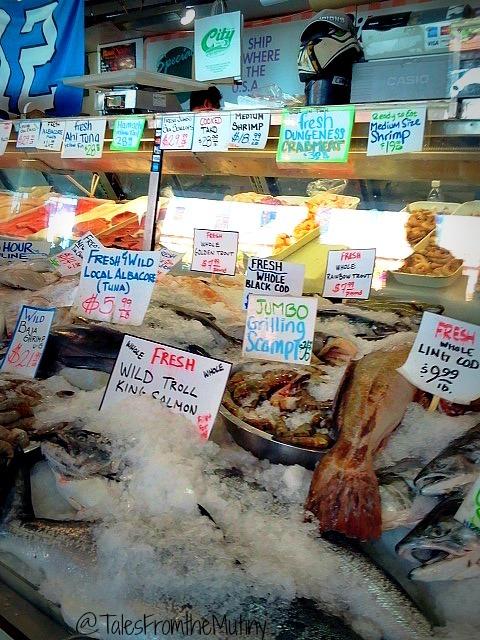 First things first…Pike Place Market. 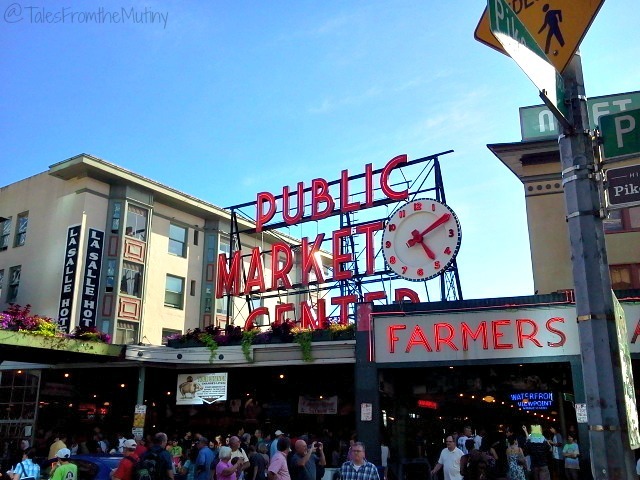 It was quite a walk from the ferry terminal to Pike Place Market, especially when you add in the stairs. There’s a lot. But not so many that you shouldn’t go if you’re able bodied. The Market is cute and fun and everything you’d expect…including crowded, but hey, that’s one of the common denominators among outdoor markets so it must be a prerequisite too. The men throw the fish (< this link had a live cam for your viewing pleasure) and put on quite a show…just like in the movies. 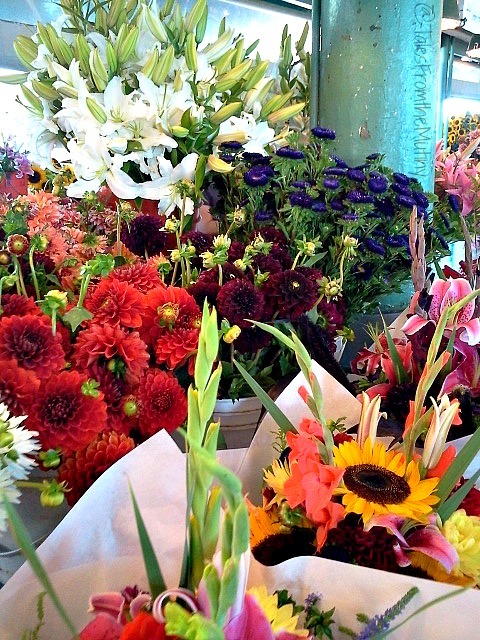 It’s bustling with activity, fresh foods, colorful flowers and trinkets of every sort. It’s easy to get caught up in the excitement. These places always get me wishing I lived in the city where I’d ride my bike everywhere filling my basket with beautiful flowers, sun ripened veggies and a warm baguette as I pedaled around in a cute skirt and sun hat. Yeah, well…back to reality and my all-purpose hiking/casual/going out pants…don’t mind that the legs zip off…and are these avocados really $3 each?? In the same vicinity, down Post Alley, is where you’ll find the infamous Gum Wall. If you want to see this beaut with your own eyes you’ll have to hurry. The second week in November 2015 the city is having all the gum cleaned off of the bricks. 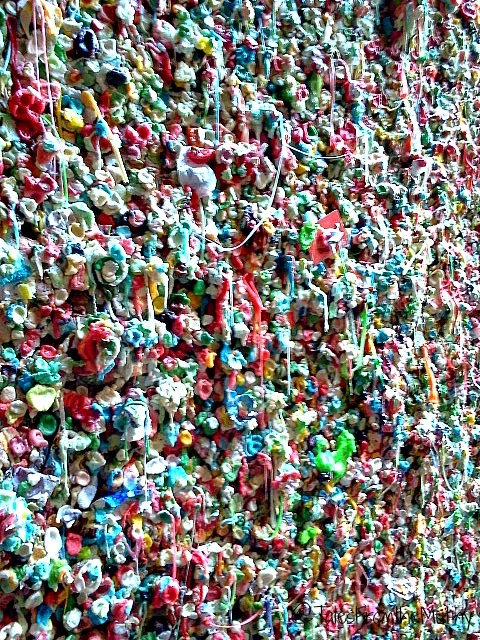 While they realize it’s likely Gum Wall will always be Gum Wall (and people will start the process all over again) they are hoping it is a little more contained in the future. While it was a pretty cool check off the “Essentric America” list it was equally gross. Now that’s a long line for coffee…especially when you’re in the coffee capital of the U.S.
Across the street from Pike Place Market I snapped a photo of a bunch of people waiting in line outside of a Starbucks. At the time I thought it was the most ridiculous thing ever. 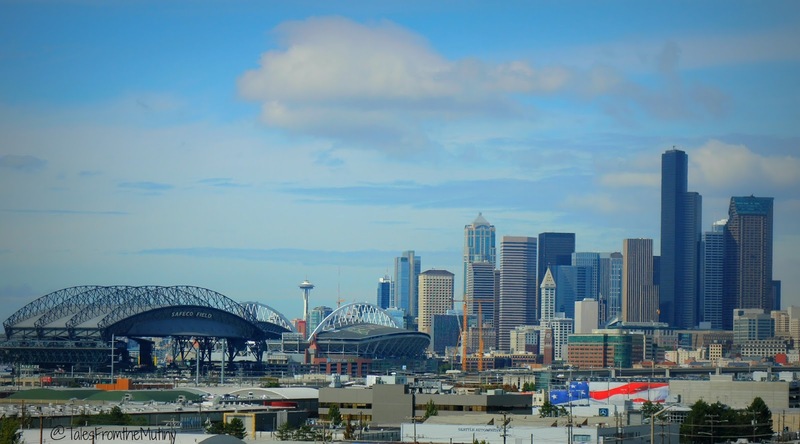 I mean, Hello…this is Seattle. The birthplace of Starbucks. They’re everywhere. On top of that, there are actually (and don’t hate me for saying this) way better coffee shops in Seattle. 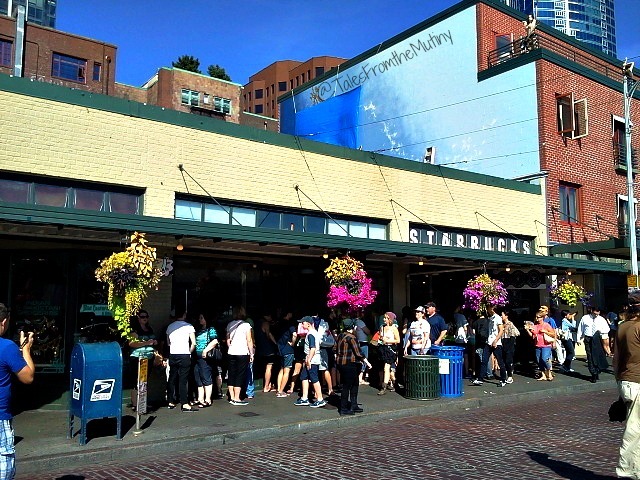 So when I posted it to Facebook I learned that this was the very first Starbucks…ever. Regardless, we still didn’t partake. Nope, we decided to stick to one of the many venues that served Stumptown (I did mention before that I’m a coffee snob, didn’t I?). 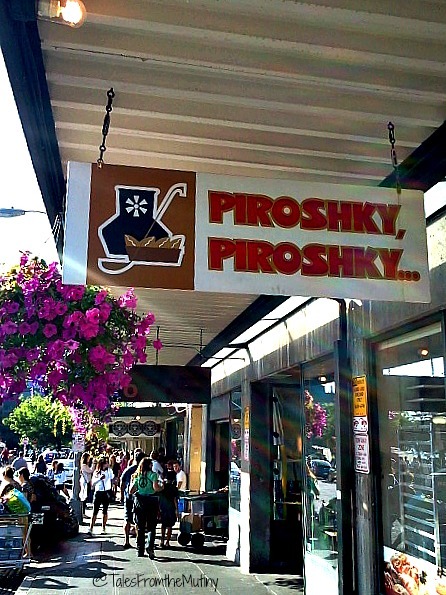 Not being too familiar with the local cuisine I did a quick search on my phone and found Piroshky, Piroshky to not only be famously recommended, but just a few feet from where we were standing. It currently boasts 4.5 stars from 3138 reviews on Yelp. It’s also a favorite of Anthony Bourdain and has been mentioned in Sunset Magazine. At any rate, they were delicious. I had the potato mushroom and Clark enjoyed the chicken, mushroom and rice. We split the apple cinnamon, which seems to be the favorite among Yelp reviewers. Great treat and easy finger food, perfect for walking and eating. 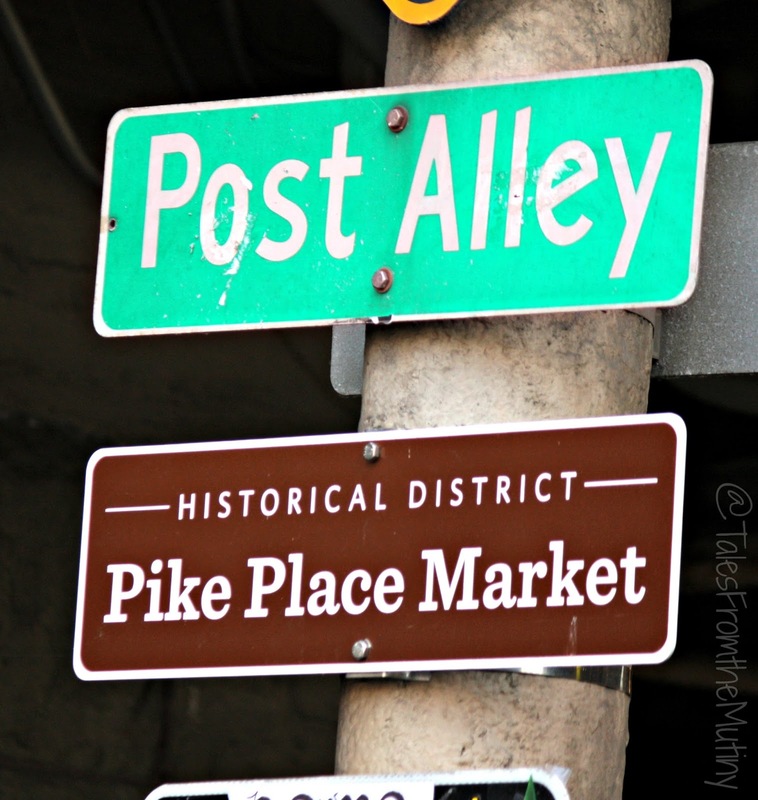 If you know any of the history of Seattle then you’ve likely heard about Seattle Underground. Basically, the city was built as many cities in the 1800’s were…out of wood and on top of the exposed land. What the builders of the day didn’t realize is that parts of the city (like Pioneer Square) were on tidelands, which was subject to flooding…and that the new gravity-assisted flush toilets that dumped into Elliott Bay would all back up at high tide. So, after the great fire of 1889 city leaders proclaimed all new buildings had to be made of stone or brick and that the roads would be regraded to raise the ground level one to two stories. 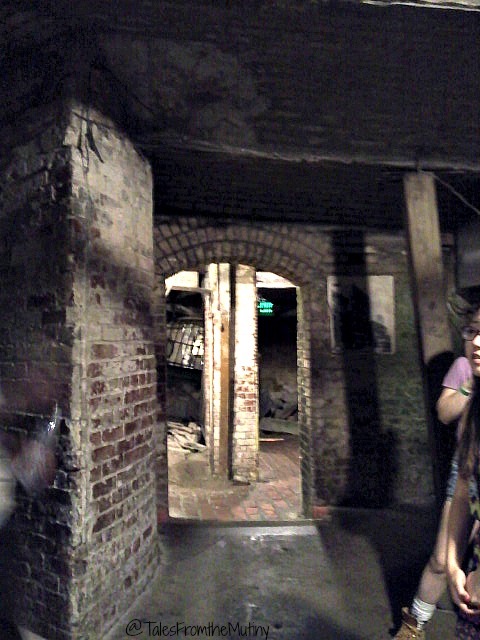 And that’s where Seattle Underground comes in. While building owners were adding floors to their buildings, the streets were being raised. For a time the main entrances were still being used. Shoppers would have to climb down ladders to get to the stores and then climb back up to get back to the street (remember, this was back in the day when ladies wore long dresses, petticoats and heeled boots). Eventually, the lower two floors were covered with dirt, sidewalks and roadways and the third floor became the ground floor. It’s really cool history and it makes Bill Speidel’s Underground Tour a fun little treat. It is a little spendy (and maybe a little cheesy) at $19 for adults, but we kinda get a kick out of these types of city tours (ghost tours are a favorite too). 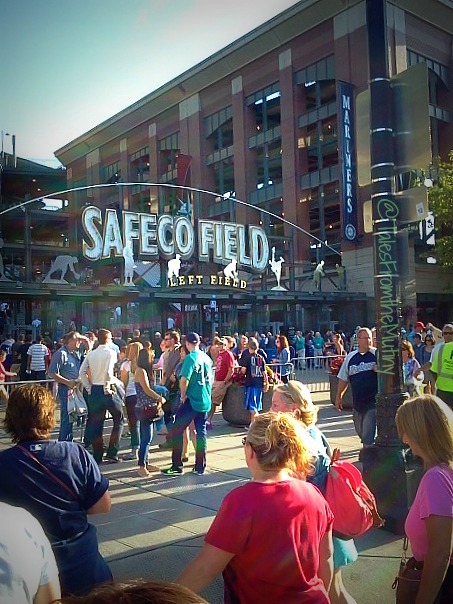 Although we never made to some of the most iconic, tourist spots in the city, like the Space Needle and Fremont Troll, we did make it a baseball game with the family. 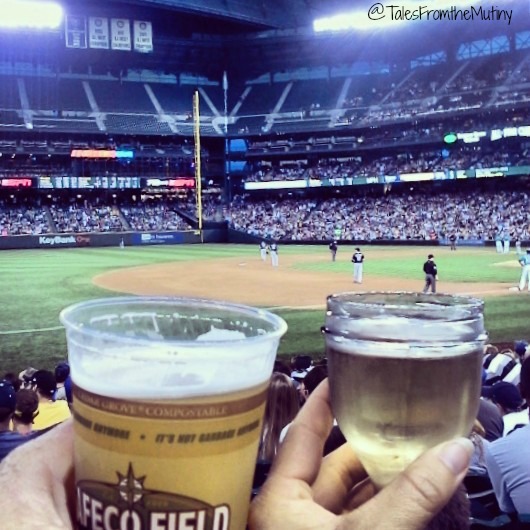 Safeco is a really nice ball field and they have a wide selection of vegetarian and vegan foods. The night we went guitarist Mike McCready played the National Anthem. McCready is the lead guitarist and one of the founding members of my favorite band, Pearl Jam. Totally made my night! Of course, so did hanging out with Eddie and Tina. Top Pot Doughnuts ~ Consistently rated as one of the top 6 donut shops in Seattle by Yelp, Zagat and Thrillest their doughnuts were good…but not Wall Drug Store (Wall, SD) or The Donut Shop (Natchez, MS) good. We also had coffee here which was quite tasty. Can you get a bad cup o’ joe in Seattle? I’m not sure. Brooklyn Seafood, Steak and Oyster House ~ Our nephew Eddie suggested this place when Clark insisted on supping on oysters since we were on the bay after all. I’ll admit I was a little worried about what I might be able to find to dine on considering I don’t eat meat. But then again, when you consider the happy hour menu there’s always the option of a liquid meal. The Brooklyn was fantastic. Seriously. It’s fancy yet laid back…so my hiking pants wearing, haven’t washed my hair in 4 days self didn’t even get a frown or double-take. Instead, we were treated like the most important customers in the joint. The icing on the cake, while everyone else enjoyed their cooked-to-order steaks and a variety of oysters the chef prepared a fabulous vegan entree just for me. That right there is top-notch. 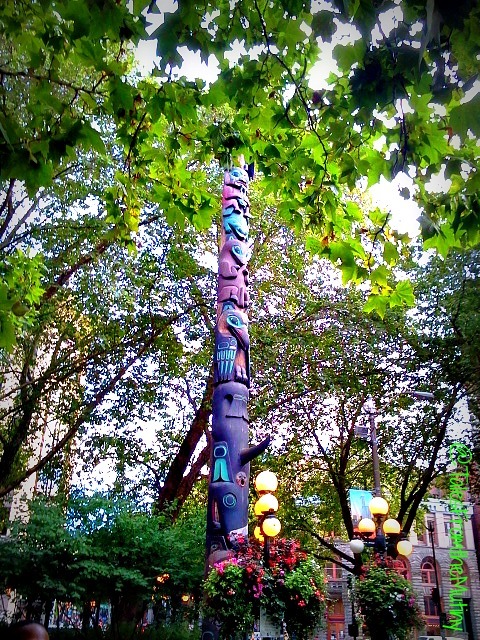 As always it was great to catch up with family and to see a small part of Seattle from the local’s perspective. We had beautiful weather the entire time and enjoyed everything Seattle had to offer…except their football team. We did the same sights in Seattle and loved it, especially the underground…..the guy who invented the toilet there was named Thomas Crapper!! i have always wanted to visit seattle as an adult! 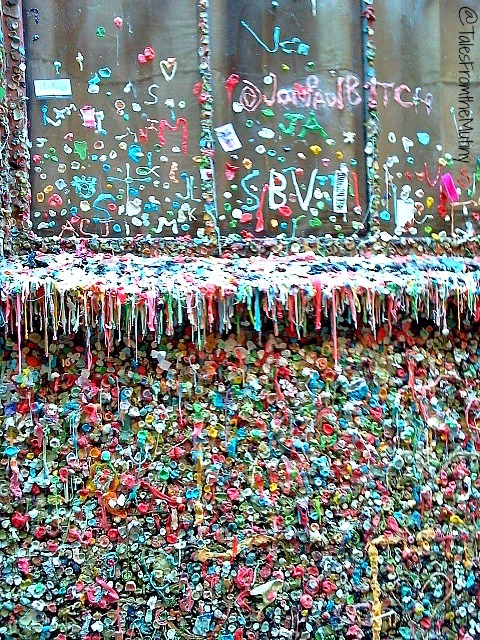 i think i will skip the 'gum wall' ha… cant imagine it going away. i had no idea about the 'underground', very interesting! thanks for sharing!